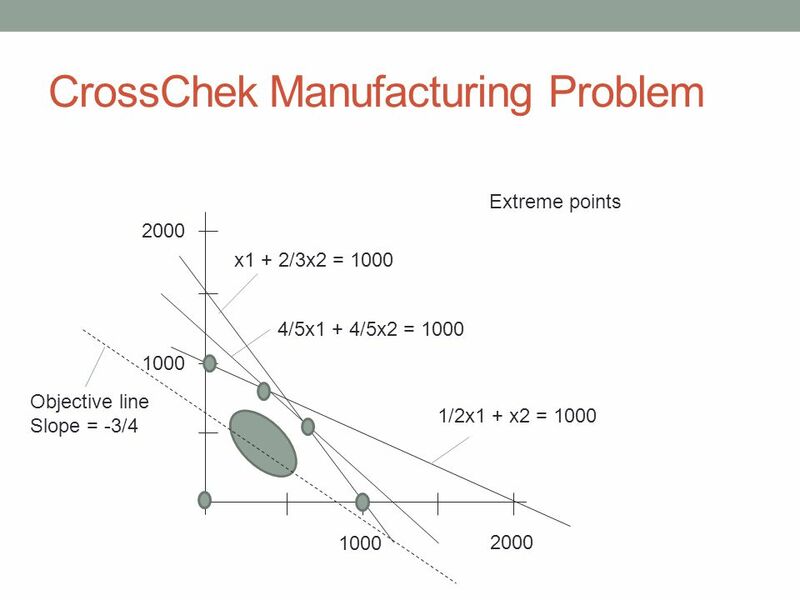 Sensitivity Analysis Consider the CrossChek hockey stick production problem: Management believes that CrossChek might only receive $120 profit from the. 1 Sensitivity Analysis Consider the CrossChek hockey stick production problem: Management believes that CrossChek might only receive $120 profit from the sale of each lower-profit hockey stick. Will that affect the optimal solution? What about a (separate) change in the profit from higher-profit sticks to $125? Max 150x1 + 200x2 s.t x1 + 2/3x2 <= 1000 4/5x1 + 4/5x2 <= 960 1/2x1 + x2 <= 1000 x1, x2 >= 0 Consider two high-end hockey sticks, A and B. $150 and $200 profit are earned from each sale of A and B, respectively. Each product goes through 3 phases of production. A requires 1 hour of work in phase 1, 48 min in phase 2, and 30 min in phase 3. B requires 40 min, 48 min and 1 hour, respectively. 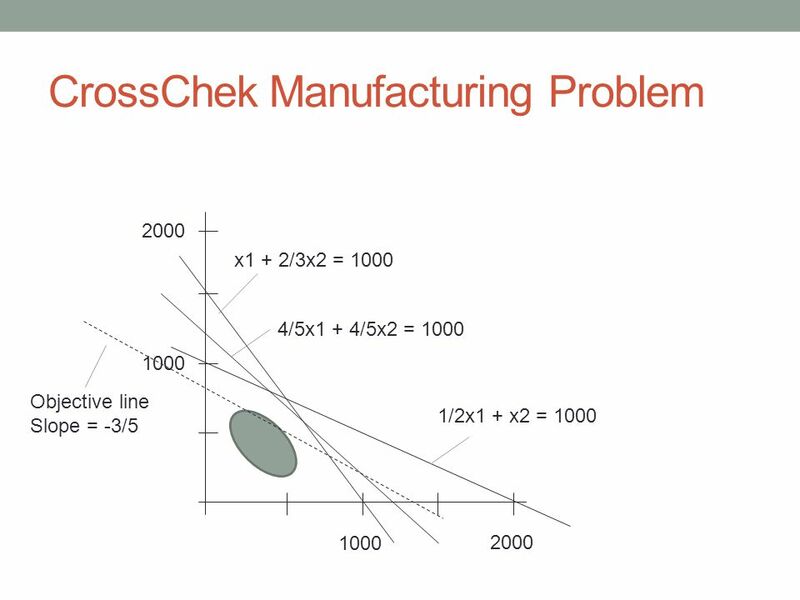 Limited manufacturing capacity: phase 1 1000 total hours phase 2 960 phase 3 1000 How many of each product should be produced? Maximize profit Satisfy constraints. 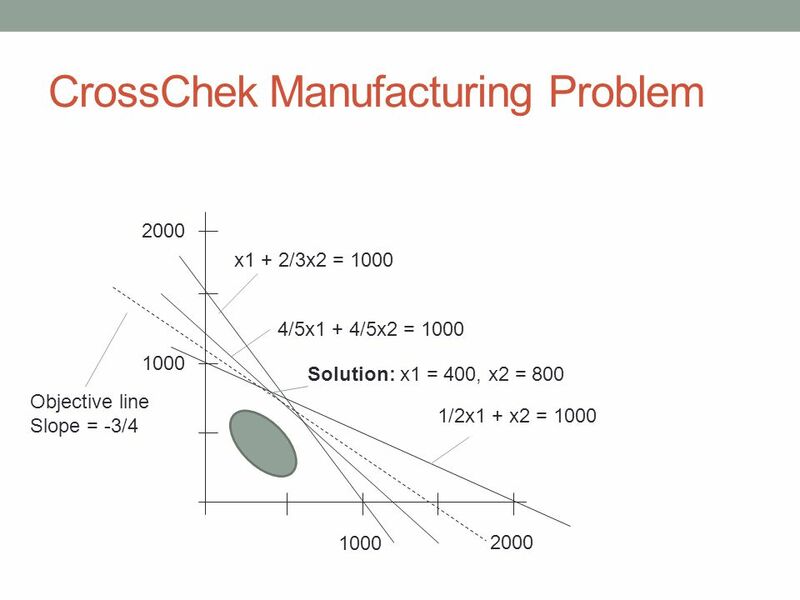 7 CrossChek Manufacturing Problem 1000 2000 1000 2000 x1 + 2/3x2 = 1000 4/5x1 + 4/5x2 = 1000 1/2x1 + x2 = 1000 Objective line Slope = -3/5 Solution: x1 = 400, x2 = 800 Same solution! 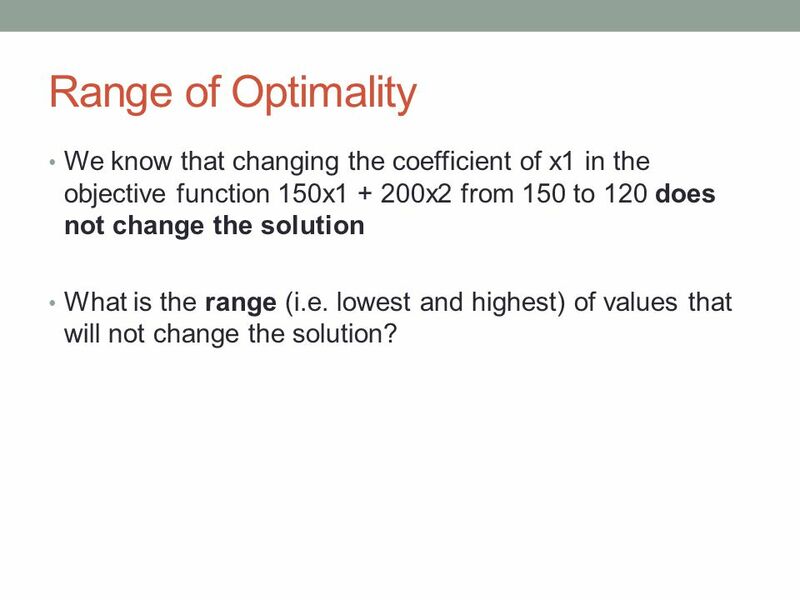 8 Range of Optimality We know that changing the coefficient of x1 in the objective function 150x1 + 200x2 from 150 to 120 does not change the solution What is the range (i.e. 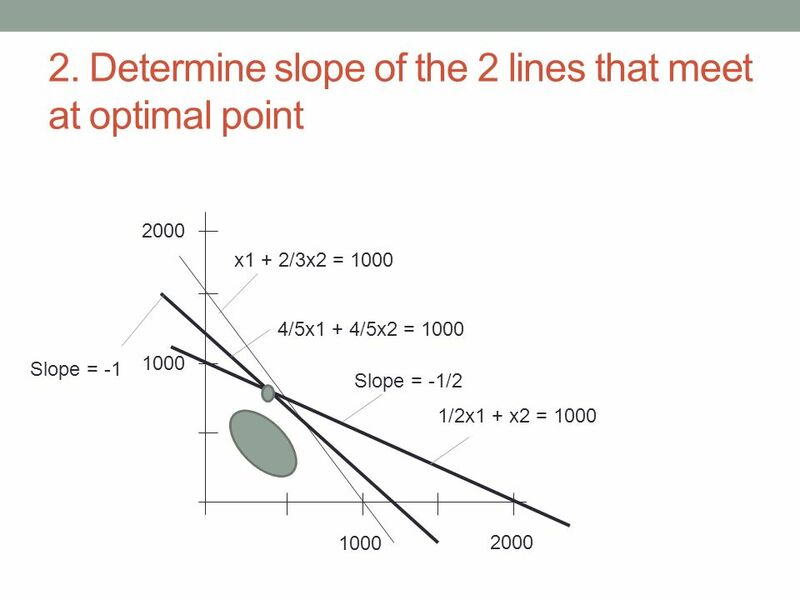 lowest and highest) of values that will not change the solution? 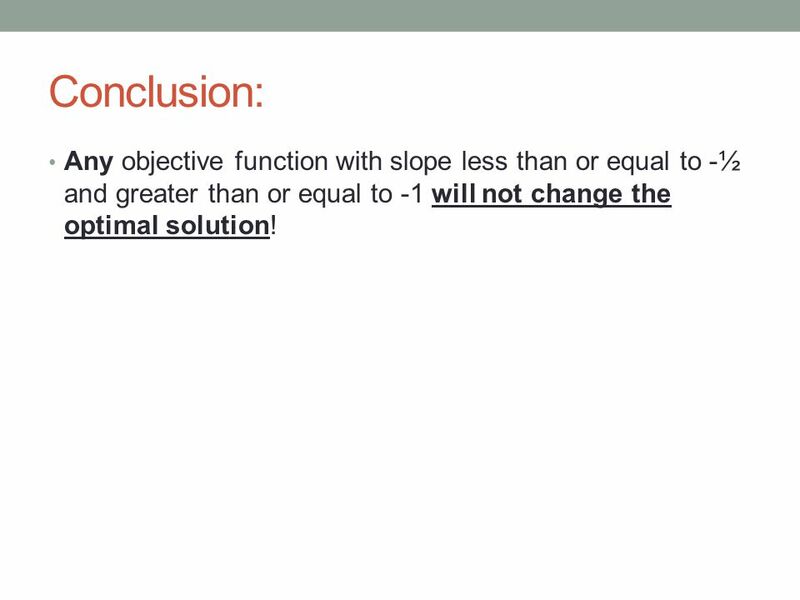 19 Conclusion: Any objective function with slope less than or equal to -½ and greater than or equal to -1 will not change the optimal solution! 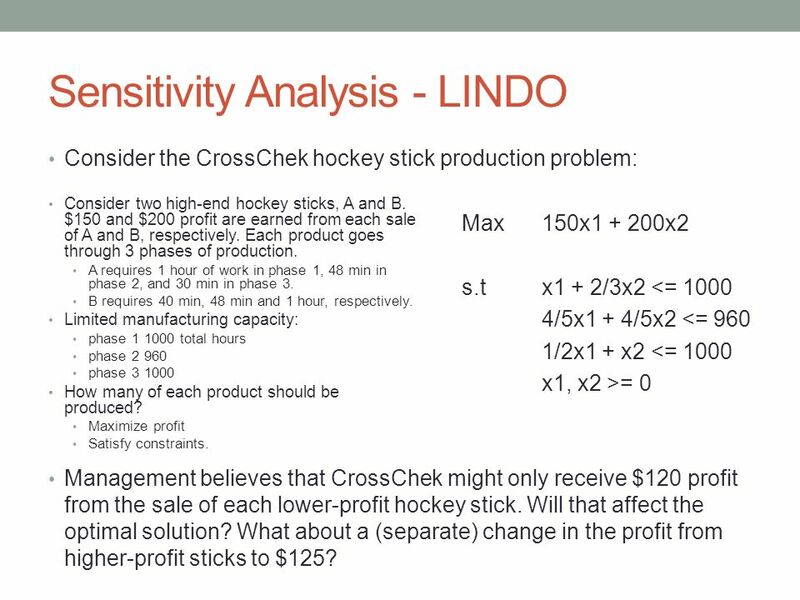 26 Sensitivity Analysis - LINDO Consider the CrossChek hockey stick production problem: Management believes that CrossChek might only receive $120 profit from the sale of each lower-profit hockey stick. 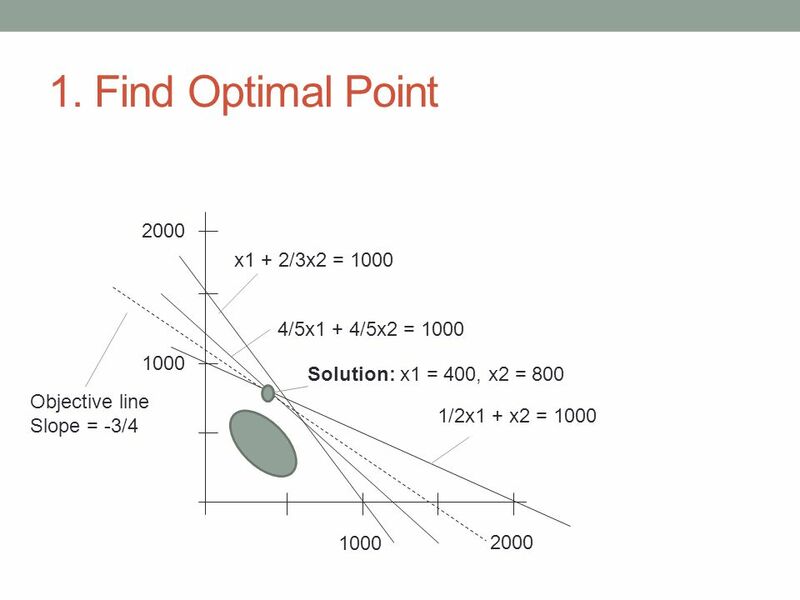 Will that affect the optimal solution? What about a (separate) change in the profit from higher-profit sticks to $125? Max 150x1 + 200x2 s.t x1 + 2/3x2 <= 1000 4/5x1 + 4/5x2 <= 960 1/2x1 + x2 <= 1000 x1, x2 >= 0 Consider two high-end hockey sticks, A and B. $150 and $200 profit are earned from each sale of A and B, respectively. Each product goes through 3 phases of production. A requires 1 hour of work in phase 1, 48 min in phase 2, and 30 min in phase 3. B requires 40 min, 48 min and 1 hour, respectively. 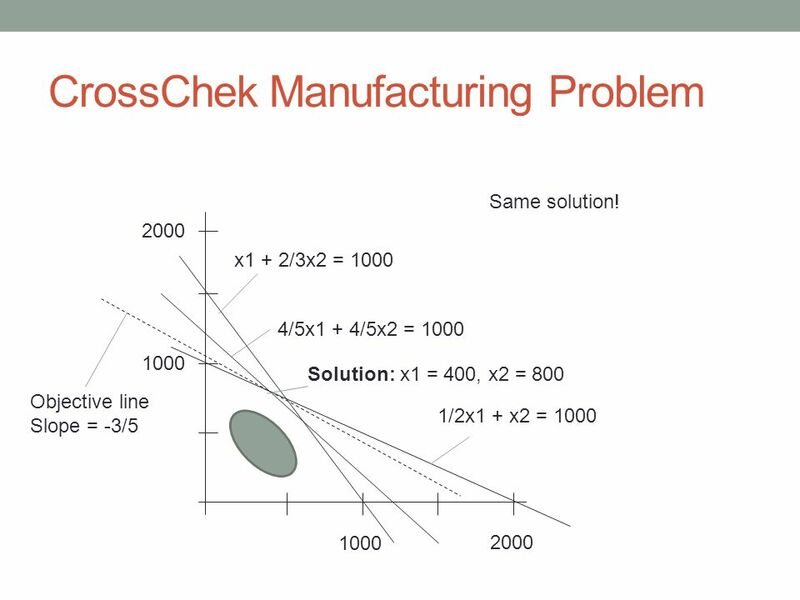 Limited manufacturing capacity: phase 1 1000 total hours phase 2 960 phase 3 1000 How many of each product should be produced? 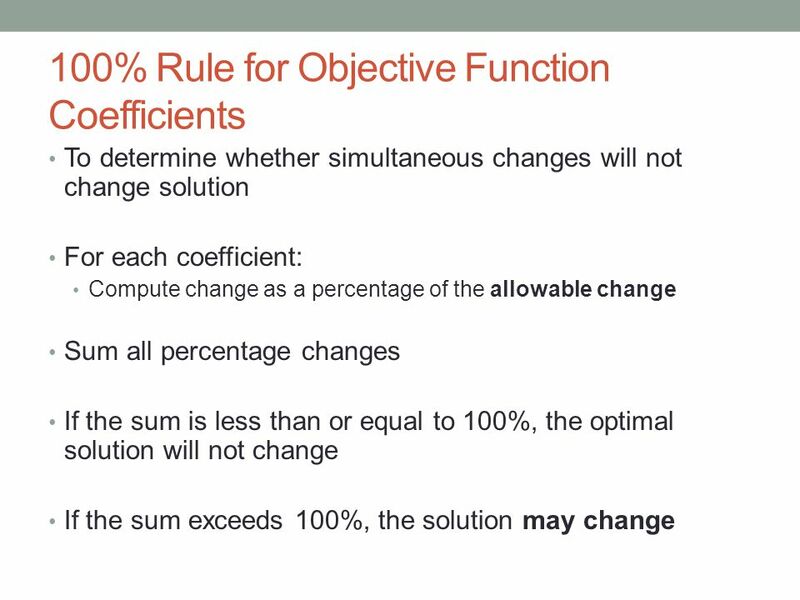 Maximize profit Satisfy constraints. 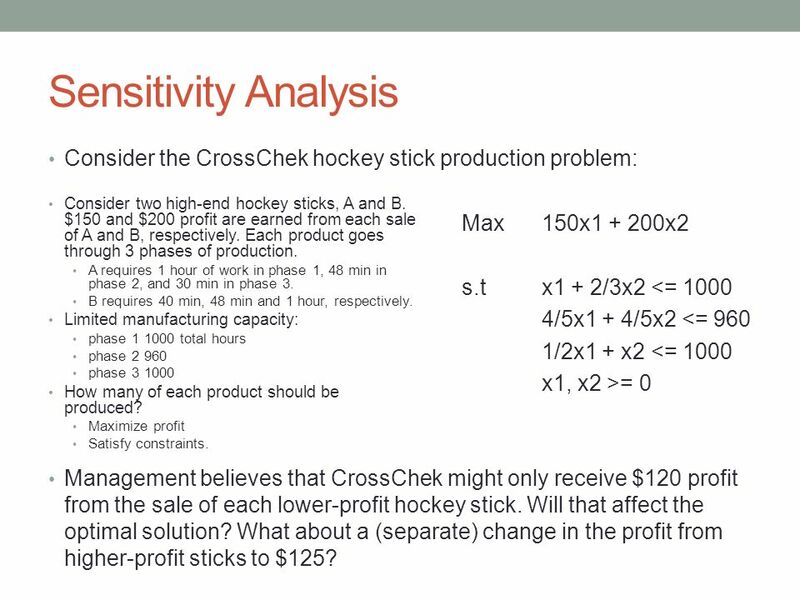 Download ppt "Sensitivity Analysis Consider the CrossChek hockey stick production problem: Management believes that CrossChek might only receive $120 profit from the." 1.Determine pricing objectives 2.Study costs 3.Estimate consumer demand 4.Study the competitions prices 5.Decide on a pricing strategy 6.Set price. 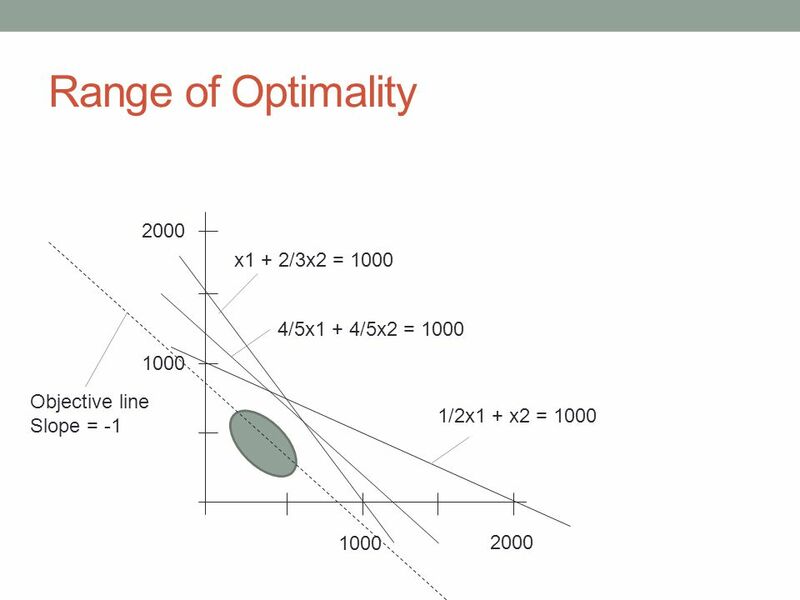 QingPeng (QP) Zhang  Sensitivity analysis is concerned with how changes in an linear programming’s parameters affect the optimal. 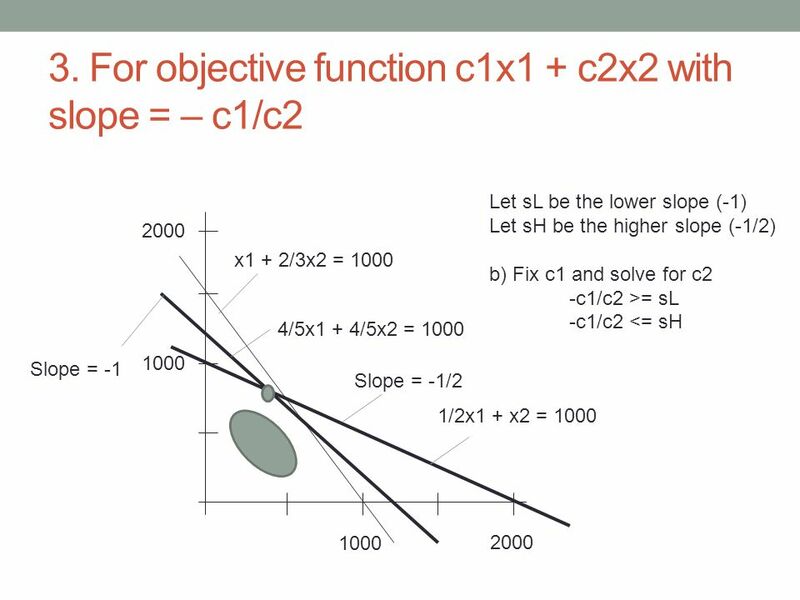 Linear Programming Sensitivity Analysis How will a change in a coefficient of the objective function affect the optimal solution? How will a change in. 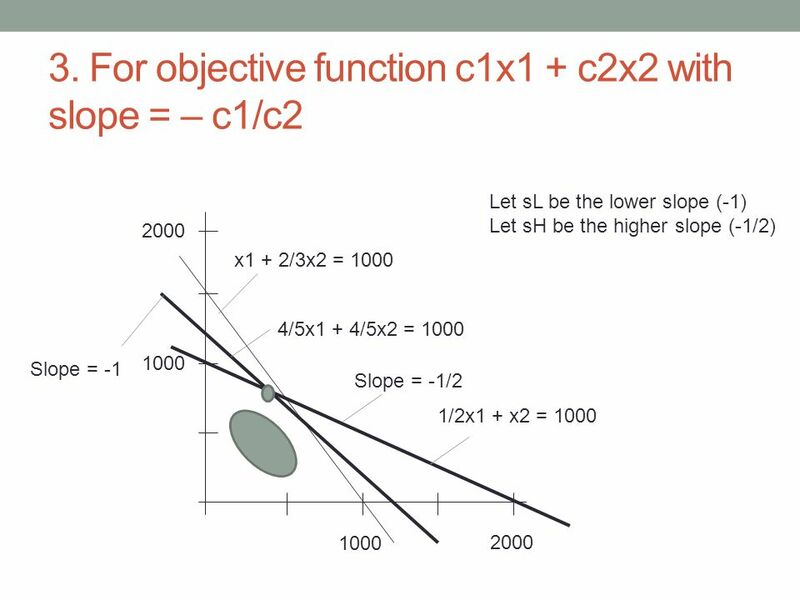 Copyright (c) 2003 Brooks/Cole, a division of Thomson Learning, Inc. 1 Chapter 5 Sensitivity Analysis: An Applied Approach to accompany Introduction to. Advanced Valuation Analytics. Balance Sheet Current Assets- Cash and Equivalents$500,000$550,000$600,000$450,000$300,000$125,000. By Katherine Wood. A glow stick is a sealed, plastic tube that contains two types of chemicals, hydrogen peroxide and diphenyl oxalate, which are separated. Based on Marketing Science 29(1), 2010 article by Thomas, Simon and Kadiyali 1. 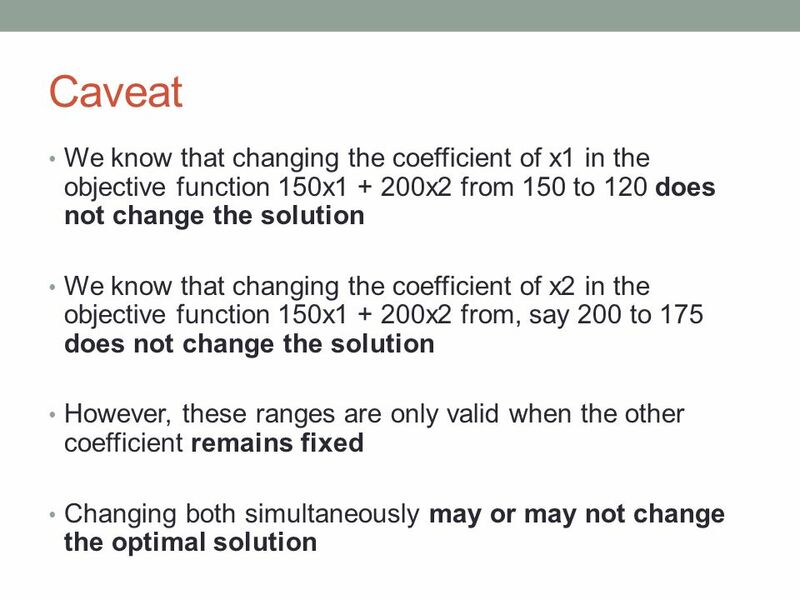 Chapter 3 Linear Programming: Sensitivity Analysis and Interpretation of Solution MT 235. 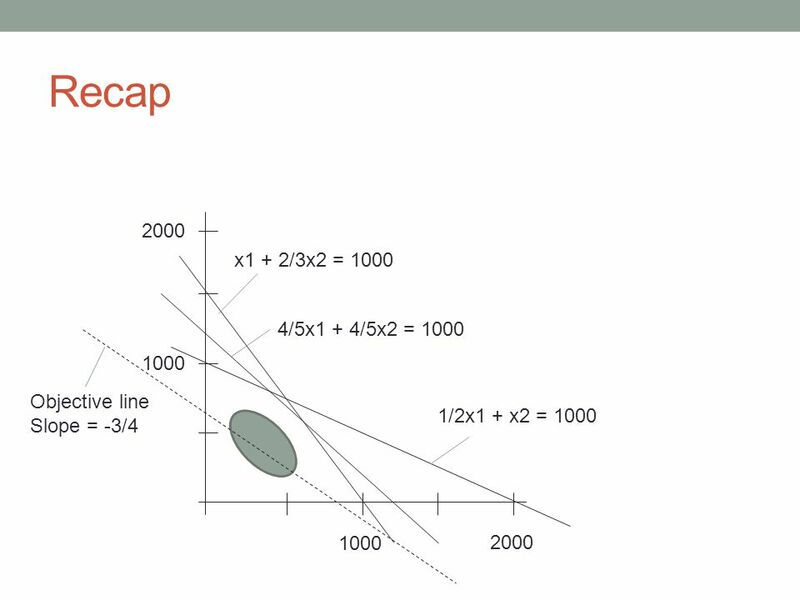 EMGT 501 HW # Due Day: Sep 14. Project 1 Introduction. Monopolies vs. Perfect Competitor Natural Monopoly vs. Temporary Monopoly - price is determined by company - Examples of each?